Clair’s involvement in many different projects has grown out of the expressed needs of her client groups e.g. staff wanting to grow food with children, the president of a residents association wanting to grow vegetables on her estate and a housing group needing guidance on formulating a garden policy. An interest in oral history and her own family’s heritage as tenant-farmers in a poor area of southern Italy prompted her to begin working on recording memories of growing food amongst today’s Londoners. In a short space of time at one children’s centre Clair led the transformation of an outdoor area covered with a mixture of “safety surfaces” and paving slabs into a welcoming green haven dotted with fruit trees and containing an award-winning kitchen garden. The fruit, vegetables and herbs are now used in children’s cooking projects, served for lunch, available at snack time and shared with parents. 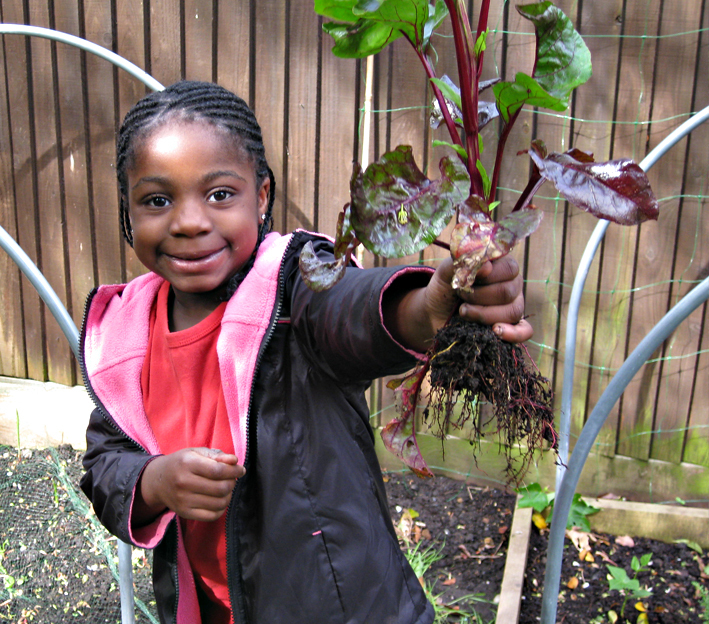 Clair has helped to spread food-growing fever amongst children and adults in one patch of north London. Over 100 people of all ages, from all local communities attended the most recent Community Gardening Day she hosted. “Community gardening is a way of reaching out to others and bringing communities together. People are proud of what they grow and love to share their food with others. Whenever I am working in my front garden on a busy east London road people stop and chat. Recently a member of the local Vietnamese community gave me a beautiful perilla plant (tiet to) to add to my edible garden”, Clair Battaglino. Clair’s was the only household garden that took part in this year’s Edible Gardens Open Day. 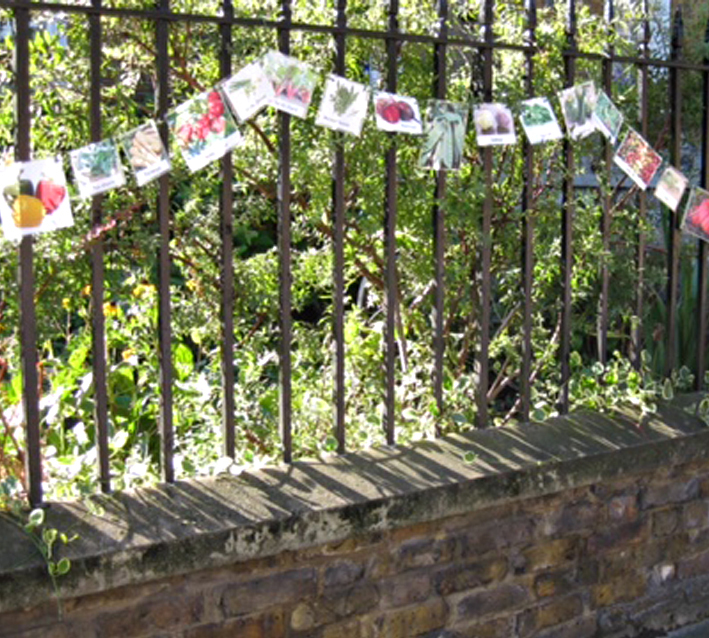 Bunting made from homemade plant labels welcomed local people to Homegrown in Hackney. More people visited her garden than many of the local public spaces, if only to taste her famous zucchini bread made from home-grown courgettes. As a founding member of Growing Green Together Clair has worked alongside colleagues in other local schools (primary and secondary) helping to establish more food growing projects. She has been interviewed as part of a student project about food growing in an educational establishment. 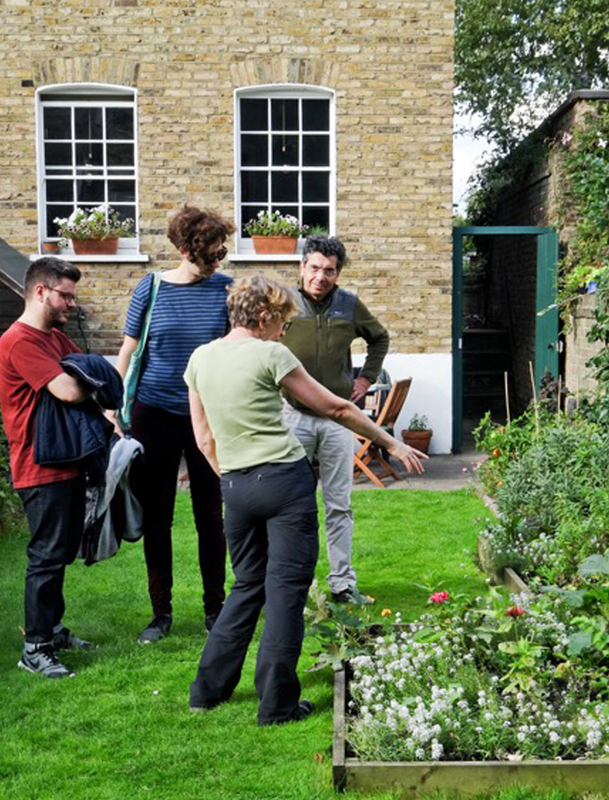 Another of her on-going projects is the interviewing of present-day Londoners about their food-growing experiences and histories of planting. A grandfather’s vineyard in southern Italy, making mango juice in Jamaica, rice paddies in Vietnam, an illicit window box on a fire escape in NYC, and many more memories are being collected for possible publication.